Nano-sized Calcium Supplement Improves Bio-availability and Prevents O – Nanova Tech Inc.
A recent research study was done by the University of Malaysia Sabah and the University of Putra Malaysia to understand the better absorption of nano-sized particles of calcium on humans, the research suggested that adding nano-sized particles calcium supplements can increase the nutrients bio-availability and thus have much better absorption by the body. This is great news because calcium is so important for the well-being of people suffering from Osteoporosis. Calcium is known to help with sleep, brittle nails, muscle cramps, dental cavities, high blood pressure, bone density and of course osteoporosis. The bones of the human skeleton contain 99.5% of the total calcium in the body. The calcium within bones is available to the body should the body need it for other purposes. It is the activity of bone osteoclasts which absorb the calcium in the bone and release it into the bloodstream. Remember, it is the calcium within the bones which makes them strong. Despite all the available calcium supplements on the market, intake by individuals remain high but osteoporosis still prevails. Lack of proper calcium is one of the most common reasons for these bone diseases. A quarter of osteoporosis cases are related to hip fractures, and this number is set to increase to one in two by 2050, according to research. However, proper nutrition and nano calcium intake can reduce the cause of osteoporosis. 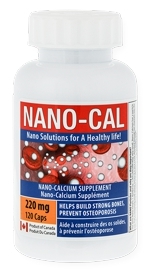 With Nano Calcium the particles have a very high absorption rate and therefore assist greatly with bone density. It saddens me to see women diagnosed with osteopenia or osteoporosis listening to their doctors and taking supplemental calcium and even problematic drugs called bisphosphonates. These are out of date approaches to the problem of weak bone density as we age. Are there any side-effects to nanoparticle size calcium? Taking calcium supplements can reduce the risk of developing osteoporosis, but they are not readily absorbed in the gastrointestinal tract. Nanotechnology is expected to resolve this problem. In the present study, we examined whether the bioavailability of calcium carbonate and calcium citrate can be improved by reducing the particle size. The morphology of nano calcium carbonate and nano calcium citrate was characterized by dynamic laser-light scattering (DLS), field-emission scanning electron microscopy (FE-SEM) and transmission electron microscopy (TEM). The measurements obtained from DLS, FE-SEM and TEM were comparable. Acute and sub-chronic toxicity tests were performed to establish the safety of these products after oral administration. The no-observed-adverse-effect levels of nano calcium carbonate and nano calcium citrate were 1.3 and 2.3 g kg(-1) body weight, respectively. The results of our in vivo studies indicate that administering nano calcium carbonate and nano calcium citrate can enhance the serum calcium concentration and maintain the whole-body bone mineral density in ovariectomized mice. These data suggest that nano calcium carbonate and nano calcium citrate are more bioavailable than micro calcium carbonate and micro calcium citrate, respectively.